Brian Brown, head of the National Organization for Marriage, has been sending out a slew of fundraising emails lately claiming that NOM is going to overturn marriage equality in this country. Wrong. Brown’s been making all kinds of other threats and false statements in his daily email missives, all out of desperation. Frankly, he’ll be hard-pressed to do anything because NOM is heavily, yes, heavily in debt, as indicated by its most recent tax filings. NOM filed both of its 990 IRS tax returns late, late last year, and they showed that revenue is way down, to well under $4 million for the combined NOM and the NOM Education Fund. This is down 400 percent from just four years ago when NOM raised and spent over $16 million. Yikes! And to make matters worse, NOM’s debt was up to $1.9 million and it owes over $650,000 to its vendors. 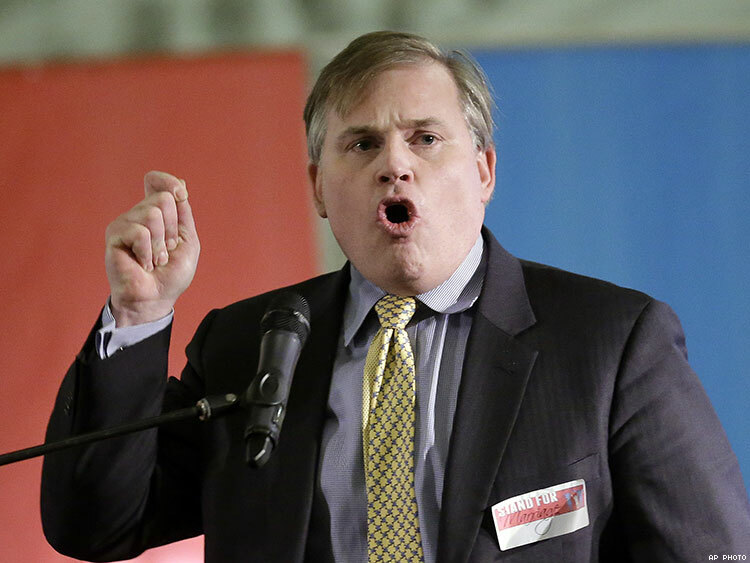 NOM barely pulled in enough money last year to cover Brian Brown’s salary, rent, and whatever it was paying NOM’s political consultant, Frank Schubert. They appear to be the last two key employees. Brown’s salary in 2015 was listed as $165,000, but as recently as 2011 he was reported to be making $500,000 a year combined from both NOM and its education fund, and it’s doubtful that he’s taken a pay cut. NOM has been considered the nation’s most virulently anti-LGBT organizationsince it was formed in 2007 by the Mormon and Catholic Churches. NOM served as the front group for both religions in order to qualify and pass California’s infamous Proposition 8. Prop. 8 narrowly passed in 2008 and ended gay marriage in the nation’s largest state. Since its win over eight years ago, NOM has reversed course and lost most all of its battles along the way to eventually losing the war. On June 26, 2015, marriage equality was ruled constitutional by the United States Supreme Court and became the law of the land. Even President Donald Trump says that he is OK with that. After the landmark Supreme Court marriage ruling 2 ½ years ago, Brown took his crusade against the LGBT community all over the world to Russia, France, and Mexico. Here at home, he’s been one of the lone wolves leading the fight against the transgender community. He now wears another hat, as head of the International Organization for the Family, which runs the annual antigay gathering known as the World Congress of Families. Rights Equal Rights (formerly Californians Against Hate) has been tracking and taking action against NOM for the past eight years. We’ve worked diligently to get NOM to be transparent — a full-time job. We started our actions against NOM back in 2009, when we filed charges with the IRS against NOM for not filing any federal tax returns during its first two years of existence. It finally did when we filed our sworn complaint against NOM for money laundering in Maine in its role as chief funder of that state’s November 2009 election to repeal gay marriage. We’ve taken 15 separate actions against NOM. We have gotten it investigated in six states and by the Federal Election Commission. The 2009 sworn complaint that we filed against NOM in Maine led to NOM being found guilty of ethics violations after a five-year state investigation of our charges. The Maine Ethics Commission stood up to NOM. NOM was fined a record $50,250 and ordered to release the names of its major donors in the Maine election by both the United States Supreme Court and the Maine Supreme Judicial Court. NOM had desperately tried to hide its donors’ names for five years in strict violation of state election law. NOM is currently under investigations in Iowa, California, and Hawaii from our filings against it. The California Attorney General’s office has been looking into allegations against NOM, Brian Brown, and Frank Schubert for the past two years because NOM stopped reporting its campaign donors and expenditures on a ballot measure it attempted to qualify in California in 2013. NOM’s pair of recently released IRS form 990 tax returns show NOM’s income has plummeted. All its expensive consultants are gone and so is its hefty staff. Current liabilities greatly exceed assets and it appears to have been comingling its charitable NOM Education Fund with their political operation — not allowed. We assume Brian Brown is still making his half a million dollars per year salary. He’s likely getting it from a variety of sources now, but it’s hard to tell where all their money goes from NOM’s cryptic 990 tax forms. We know that founder and former president Maggie Gallagher is long gone; Chris Plante is gone, and CRC, its high-priced Alexandria, Va., PR firm, is gone. Its fancy lawyers like James Bopp and Cleta Mitchell are gone and NOM’s Washington, D.C., office appears to have become just a mail drop like its first office was in Princeton, N.J., eight years ago. It looks like the Mormon Church has fled from the troubled NOM. All of NOM’s Mormon board members are gone, including cofounder and current Utah Valley University President Matthew S. Holland (son of Mormon Apostle Jeffrey R. Holland), science fiction writer Orson Scott Card and two very wealthy Mormon real estate developers, Broc Hiatt and Craig Cardon from Mesa, Ariz. Hiatt and Cardon have the distinction of being the first major Mormon donors to the Yes on Prop 8, campaign. Their $60,000 in early campaign contributions was the first to tip me off that the Mormon Church was the major force behind the Prop. 8 campaign. NOM’s number 1 donor, Sean Fieler, who has given NOM millions, appears to be off on to other issues. Several of its other big donors have left, like Amway president Doug DeVos, who had given $500,000 to NOM in 2009 and $250,000 in 2012. We have heard, but it’s not confirmed, that the DeVos family has since pledged not to give any more money to anti-LGBT organizations or campaigns after our successful Amway Boycott. Family member Betsy DeVos was recently confirmed by the U.S. Senate as secretary of Education. San Diegan Doug Manchester, who gave NOM $125,000 to qualify and pass Prop. 8, promised not to give any more money to fight gay marriage after our successful boycott of his hotels. John Templeton Jr., a major NOM funder, passed away in 2015. We think that the Knights of Columbus, the political arm of the Catholic Church, and a couple other donors are all that’s left of NOM’s donors. In fact, just three contributors were responsible for about 40 percent of the money that NOM raised in 2015. We have been working with some experts in tax-exempt law and forensic accounting to carefully analyze NOM’s latest two 990 federal tax returns and we will file a Form 13909 with the Internal Revenue Service to seek another investigation into NOM if it is warranted. Our fight for truth and transparency from the leading opponents of LGBT civil rights will continue. • Direct transfer of funds from the 501(c)3 entity to the other organization. • Paying expenses of the other organization. • Non-arm's-length dealing for shared facilities or employees. • Use of the IRC 501(c)(3) mailing list on a preferential or non-arm's length basis. It is my considered opinion that National Organization for Marriage Education Fund (“NOM-Ed”), a 501(c)3 is subsiding National Organization for Marriage (“NOM”), a 501(c)4 organization. This calls into question not only the legitimacy of the 501(c)3 but whether or not contributions for 2015 qualified as tax deductible. At the end of 2013 NOM-Ed was owed $1.9 million by NOM. Without those loans, NOM would not have been solvent. (It remains technically insolvent.) Management claimed at the time that this was an advance of management fees. However, economic logic does not support this hypothesis; not in the size of the fess and not through liquidation of the debt to date. It would appear that the management fee was set arbitrarily to conform to the cash requirements of NOM. At the end of 2015 NOM owed NOM-Ed $628,000. The reduction in debt appears to be a journalized adjustment rather than an actual transfer of funds. During 2015, NOM-Ed’s accounts payable swelled from $139,540 to $593,709 without any appreciable activity to support funds due vendors. Indeed, reviewing program expenditures, there is no apparent justification for these sums other than the activities of NOM, the 501(c)4. Without appreciable activity, NOM-Ed claims to have expended $270,000 for conferences and conventions and $620,000 in shared costs. An audit will most likely confirm that NOM-Ed is paying a substantial amount of NOM’s bills. Moreover, is unlikely that shared facilities and employees are on an arm's-length basis. I can confirm, for a fact, that the two organizations are using a shared mailing (email) list, again, not on an arm's-length basis. FRED KARGER is a longtime political consultant, LGBT rights activist, former presidential candidate, and founder of Rights Equal Rights.